It is very easy to draw using TVPaint Animation. 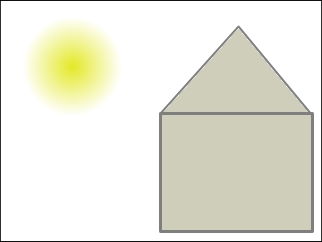 In this second lesson we will draw a small house (see below) using TVPaint Animation's tools. In this way we can study the basics which will allow you to express your artistic talents. Even if it is possible to draw with a trackball or mouse, it is strongly recommended to use a graphic tablet equipped with a stylus. This tool requires getting used to for beginners but it is much more natural to use for drawing.